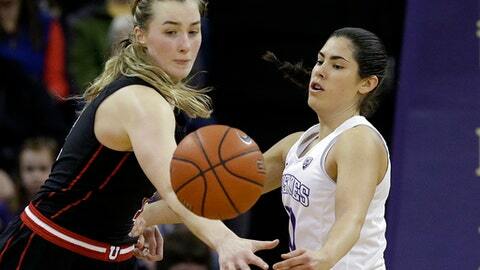 SEATTLE (AP) Kelsey Plum was ready for her chase of the NCAA all-time scoring record to come to an end. For the final regular season game of her college career, Washington’s star orchestrated the finest performance of her career and one of the best in NCAA history. And with it, Plum scored a career-best 57 points and put an end to her quest of tracking down Jackie Stiles and the number 3,393. Now, no one has scored more points in NCAA history than Plum. Plum carried No. 11 Washington to an 84-77 victory over Utah on Saturday with a dazzling performance. She needed 54 points entering the day to break Stiles’ record and did so with a second-half barrage where Plum couldn’t be stopped. Plum hit 19 of 28 shots and was 13 of 16 at the free-throw line. She had 38 points through three quarters and took over in the fourth after teammate Chantel Osahor fouled out early in the quarter. Plum tied Stiles’ mark with a hesitation drive and scoop over the outstretched arm of Utah center Emily Potter with 4:57 left in the game. After a Utah basket and a timeout, Plum hit a runner from just outside the lane with 4:06 remaining to move past Stiles on the all-time list. Plum scored 19 of Washington’s 22 points in the final quarter and now has 3,397 career points. The fourth quarter was the perfect sequence of shots for Plum to eclipse Stiles. Starting with a 3-pointer and capped by the 10-foot runner to hold the mark alone, they were each examples of how Plum is a multi-dimensional player that can’t be slowed by simply taking away one part of her game. ”She did tonight exactly what she’s done for us since she got on campus, what is needed. We needed her. We needed every one of those shots,” Washington coach Mike Neighbors said. Washington needed all of her points to hold off a challenge from Utah (16-13, 5-13 Pac-12), who hung around just enough to make the Huskies uncomfortable. Neighbors even questioned his decision to pull Plum with 44 seconds remaining and give her the ovation she deserved, but leading by just eight points. Perhaps fittingly, Plum’s 57 topped Stiles’ career-best of 56 points, even as Plum was trying to get over an illness and ate applesauce on the bench during timeouts. Neighbors also expects Plum to complain in the coming days about her three missed free throws that could have given her 60 and a share of the NCAA single-game scoring record. As it stands, she’ll have to settle for school and Pac-12 single-game marks. Utah: The Utes must wait for the final day of the regular season to see results of other games before knowing what its seed will be for the conference tournament. Washington: The Huskies will be either the No. 2 or No. 3 seed for the upcoming Pac-12 tournament next week across town at KeyArena. Washington can only move up to the No. 2 seed if Stanford loses on Sunday at Oregon. The Utes pulled within three early in the second half and staying close enough in the fourth quarter that Plum was needed. Paige Crozon led Utah with 22 points and Tanaeya Boclair added 15. Utah: The Utes will play on the first day of the Pac-12 tournament next Thursday.